An industry knows it has officially arrived when it gets a special Tech Zone at the gigantic Consumer Electronics Show in Las Vegas. At the 2014 extravaganza next month, the 3D Printing industry will have its own exhibit area plus a new conference track specific to the topic. “Don’t Believe the Hype? – 3D Printing Uncovered” scheduled for January 8 will include talks from industry experts who “know the difference between innovation and fad”, according to the CES 3D Printing Tech Zone media partner TCT Magazine + Personalize. Given that the 150,000 CES attendees are focused on consumer products, the 3D Printing emphasis will follow developments that aim toward the large consumer market. Two strong areas for 3D Printing applications are special effects for the movies, and sportswear. Jason Lopes from Legacy Effects will talk about how Hollywood movies such as Avatar and Iron Man benefited from the technology. Wearable 3D Printed items get a lot of press and Under Armour will have Technical Design Manager for Innovation, Alan Guyan describing how the industry leader is keeping its edge with 3D Printing. The CEO’s of major 3D Printing equipment suppliers will also be speakers, again with emphasis on their products for mainstream markets as well as discussion of big deals with service providers adding 3D Printing to their offerings. 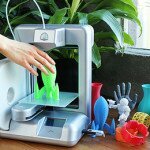 Avi Reichenthal, CEO of 3D Systems, has engineered partnerships with office supply chains Staples and Office Depot among others, to make sales of the popular Cube home 3D printer accessible to everyone. Conor MacCormack, CEO of Mcor Technologies, has brought big brand Staples in Europe into the fold for Mcor’s paper-based machines and the CEO of Sculpteo, Clément Moreau, calls the app and software company, the “3D Printing Cloud Engine”. Rapid News Communications Group, which owns the TCT Magazine + Personalize brands, got its start in the early 1990’s when rapid prototyping including 3D Printing technologies were just getting started. Over the years they also covered the next phase of 3D Printing in additive manufacturing. With this level of expertise, TCT Magazine and Personalize are uniquely positioned to know how to cut through the hype and give the consumer electronics industry real insight into how the world is changing with the advent of 3D Printing.